Firefox users may install basic themes that change, more or less, only the address bar and tabbar of the web browser, and they may install extensions that may also change the appearance of the browser or the style of individual sites only. Firefox users may use CSS to style the browser. Mozilla works actively on improving theme related capabilities of Firefox. While those will probably never match the capabilities of full themes, new APIs did and will introduce new theme-related options in Firefox that developers may take advantage of. Dynamic Weather Theme is a simple extension at its core. The extension changes the theme of the Firefox web browser based on the weather conditions of a location that you set during the initial configuration of the extension. The extension loads the configuration page after installation automatically. You may open about:addons and click on the options link of the extension to open the configuration at any time as well. The Firefox add-on supports two options to set a location. You may use geolocation functionality or set the location manually. Geolocation has the advantage that it changes the location automatically when you travel; the feature is not useful if you use the browser in a single location only. Setting the location manually is easy, just enter the city name and country, and hit the submit button. If your city is not found, try a larger one nearby instead. 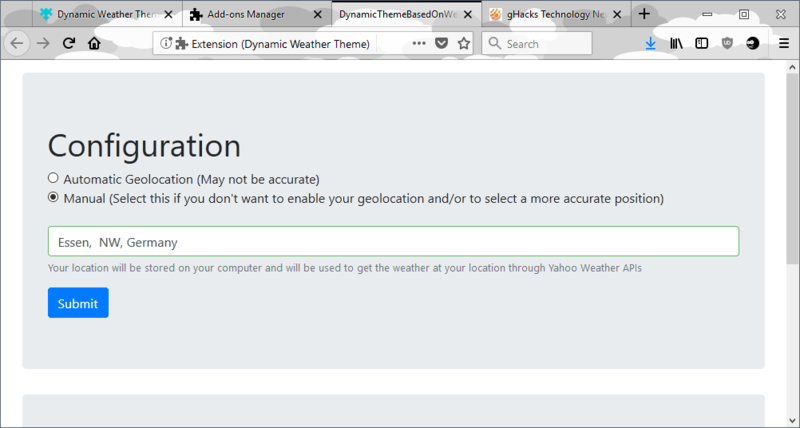 The extension uses [GET] requests to get weather data from Yahoo Weather. Note that it needs to communicate with Yahoo for that. The developers may add support for different weather services in the future to give users more choice. The extension updates the theme of the browser based on changing weather conditions. You get a cloudy background if the weather is cloudy, a sunny background if it is sunny, and a night background at night (and so on). I have to admit that I'm not a huge fan of themes that throw some paint on the Firefox toolbars as I find the themes distracting, especially if they decrease readability of tab titles and (some) icons. Dynamic Weather Theme does that and that is the main reason why I won't use it. I do think, however, that it is a nice idea that some users will certainly love. Now You: Do you use themes or do you run the stock-browser theme? First of all, I have to state that for most I am not a fan of any Yahoo product and always trying to avoid their products. No, I think this could be a nice product but I am waiting more for a theme who will adjust himself to the time of the day. Reply to the question (Do you use themes or do you run the stock-browser theme?). Themes I am implementing is Black by MaDonna (Designed by MaDonna). For the power saving measures and countermeasures against asthenopia, the background favors the entire Black specification. For that reason, I used Add-ons’ Dark Background and Light Text (https://addons.mozilla.org/en/firefox/addon/dark-background-light-text/) in conjunction with ‘F.lux’ I will. this is actually pretty interesting but most of the fancy themes I’ve tried mangle text on the browser. I use a plain seafoam theme called Reunfiordi on FF. I had dream of Daves for years, love that one. Skies Full of Sunshine is currently on TBird. Chromium, I don’t bother with themes, most have little artistic merit, so I use the windows border color. Seems many themes are made just to make a theme, some make browsers unusable. I found an attractive light yellow gradient with white letters, it was, well, very yellow with almost invisible text. I use personas in Waterfox: space comet, Moon and Earth … (no problem with the text of the browser). On a more serious note – Nothing can beat a good dark skin in my opinion.